Hello lovely crafters it's Brenda here home from a very hot holiday in Lanzarote but back to flash floods and much cooler weather, brr in fact it has been quite chilly in the evenings. So let's have something to cheer us up and I'm thrilled to leave you in the hands of a fabulous artist and crafter, someone who creates the most stunning projects and is here to share her fabulous talent with us all. Hello! It's Jan Hobbins here from Edmonton, Alberta, Canada. 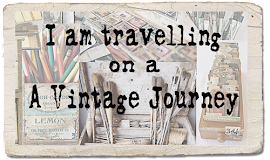 I'm very excited to be your Guest Creative Guide today, here at A Vintage Journey. My introduction to scrapbooking started 10 years ago when I went to work for my sister who had just purchased a scrapbook store. I've been hooked ever since! I'm currently on the Sizzix Design Team and have enjoyed the challenge of creating with dies, especially those Tim Holtz ones! 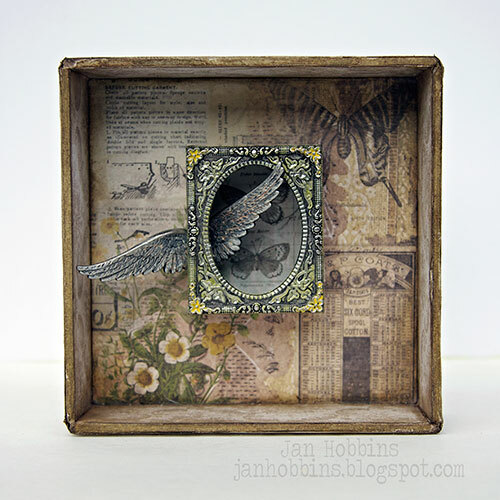 I have also had the privilege of being on the Tim Holtz Media Team and for a few years now, creating for his CHA booth. I think I've always been drawn to anything Tim creates. His products reflect everything I love about paper crafting; from the different mediums, to the papers, embellishments, and the dies. To me, it's all about using your imagination to take something as simple as paper and just create art. 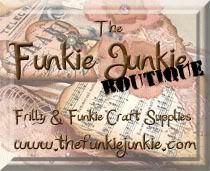 If you would like to see more of my creations, you can find me here. For the monthly theme, Things with Wings, I was inspired by Tim's wonderful Wallflower patterned papers and vellum collection. I've been using his patterned vellum with many different dies lately, I love the light airy look of vellum flowers and for this project, butterflies. For my project I've created a small shadow box, hope you enjoy! 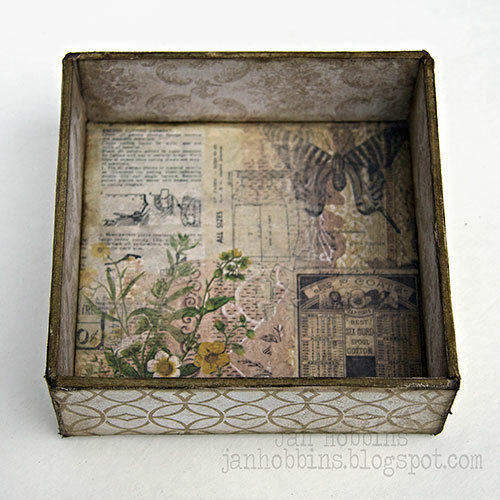 I love making little vignettes inside boxes. I have created a few with those Tim Holtz clocks too. The base for my shadow box is Tim's square 5.5" x 5.5"Configurations box (TH92883). 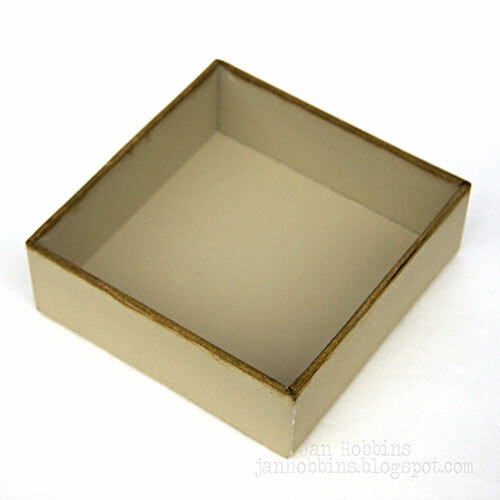 If you aren't familiar with these, they are a sturdy paper board box filled with small boxes and include a framed acetate lid. I removed the boxes and lid and will save those for another project. To start off, I inked my edges with Walnut Stain Distress ink. Pieces of paper from the Wallflower collection were cut out to cover the entire inside and outside of the box. They were adhered with Ranger's Multi Matte Medium. I like using this gel medium, it's a super strong paste, its also a good sealer, and dries clear. The edges of the inside and outside pieces were inked before adhering. 2 1/2". It's probably easier at this point to make a small slit on one of the longer sides to secure your outside wing. I didn't decide to use the wings until after my box was constructed so it was a bit more awkward to make a cut with my craft knife through the chipboard. It's just a small slit, about 1/2 long, just enough for the bottom of the wing to fit into. To adhere these pieces together, I applied Ranger's Matte Medium to the outsides and then wrapped tissue tape around the box. The tissue tape is thin and secures the sides of the box. A small piece of patterned paper was cut out to fit the inside, inked, then adhered. Cover the inside and outside walls with patterned paper. 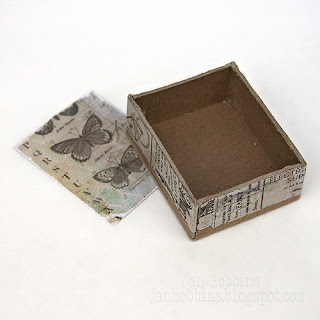 The Tim Holtz Foundry Frame (TH93198), which should be the same size as your box, is adhered to the top. Before adhering, I lightly painted the frame with Peeled Paint and Mustard Seed Distress Paint, wiping off the excess, so there's just a hint of colour. Adhere this to the box using a strong adhesive (I used SookWang tape). The metal wings are from Tim's Regal Adornments pkg. (TH92903) and were also lightly painted with Frayed Burlap Distress Paint. I attached the wings with hot glue on the backs, the outside one secured into the slit. I was worried the inside wing would to be heavy to hold with just glue on the end, so I stacked a few tiny globs of hot glue near the center of the wing underneath before adhering, to give it something to rest on. I hot glued the box to the inside of the shadow box. 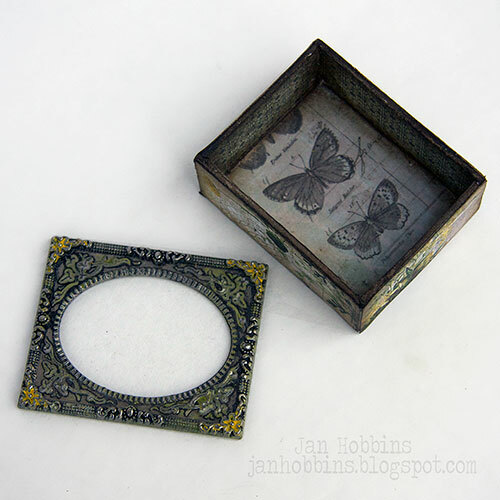 For my small butterflies, I used one of my favourite dies, the Tim Holtz Decorative Strip, Butterfly Frenzy (659575). There's a lot of butterflies on this die, all shapes and sizes. The larger butterfly is from the Bigz die, Butterfly Duo w/ Texture Treads (660236). This has two different butterflies on the die and it comes with a coordinating embossing folder. I cut out three of the larger butterfly and embossed the top layer only. These three layers are adhered together with a clear glue dot. All the butterflies are cut out from the Wallflower Vellum paper. 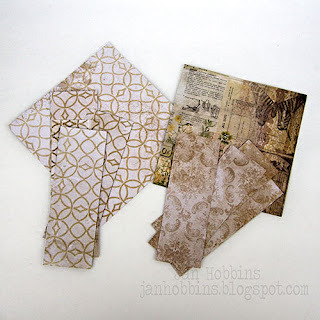 I get asked a lot about what to do with the patterned vellum, especially the larger patterns. I use them more for the colour and once they are die-cut you don't really notice the pattern or illustration. I know it's hard sometimes to cut up those beautiful illustrations, but they make the most beautiful translucent flowers and of course butterflies! You can even add in more colour with alcohol ink. Before adhering the butterflies, I glued in my letterpress word "fly"(Tim Holtz Idea-ology TH93130 letterpress blocks) that had been lightly painted with Mustard Seed Distress Paint. 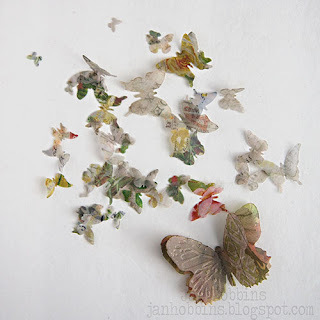 The butterflies were randomly adhered onto my shadow box, the larger one on top of the blocks. I also die-cut some Tiny Tattered Florals (660227 Thinlits Die) with Core-dinations Distress Cardstock and glued those inside the Foundry Frame with a few butterflies, and around the bottom of the shadow box. I finished off my project with a quote, "Your Wings Already Exist, All You Have To Do Is (Fly)." I printed that on white cardstock, cut it into pieces, added in black lines with a marker, and adhered to the inside of my box. My project is done! Hope you enjoyed my rather long tutorial, ...sorry about that! I think wings have a symbolic meaning for many different reasons, and they appeal to everyone. This would make a great gift for any occasion! 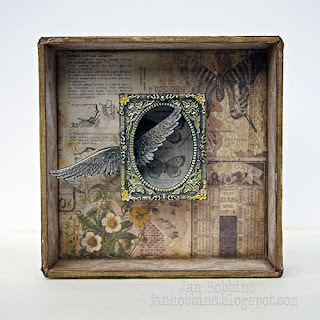 Thank you for being here Jan and with such a fabulous project too, it is absolutely delightful and I adore the wings in the little added box, such a great design. 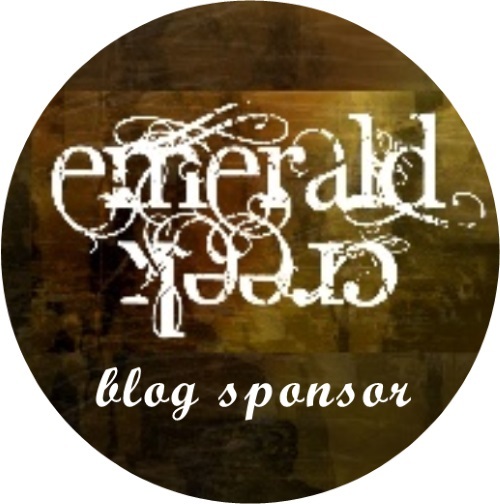 Well fellow travelers I am sure you have loved Jan's post please do pop over to her blog to see her other amazing work and if you haven't yet joined our Vintage Journey challenge you have till next Thursday evening (UK time) to enter. The new challenge will go live on Friday 4th September and we will have some exciting news to share with you. Also don't forget to join us Monday for the last in our August Destination Inspiration terminal pit-stops. My huge thanks to Nikki for sharing the last two Friday posts with you whilst I was away she did a brilliant job. We really do have the most incredibly talented team here at AVJ and wonderful people who pitch in and help out in whatever capacity they can. Thanks ladies you are super-stars. Thanks for joining us today and have a fabulous weekend. A-mazing seems so lame when I look at this project Jan. Absolutely original too. Loving the wings and shadow within a shadow box. Very vintage, like something old you'd find at a Paris Flea Market. Enchanteur mon ami. 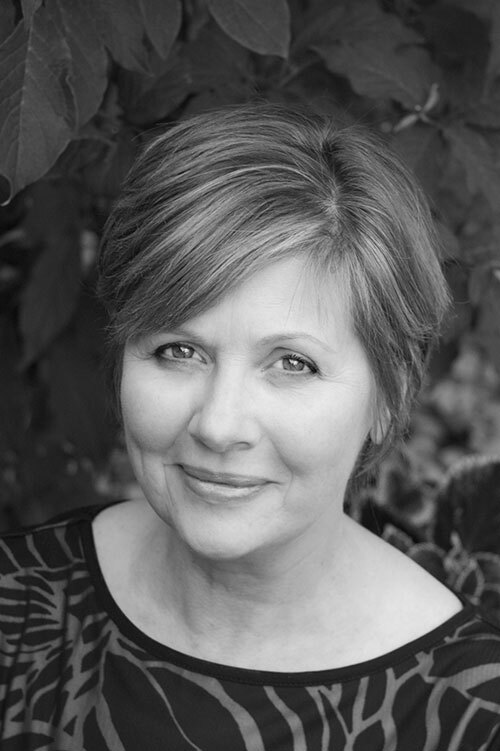 Truly fabulous - love all the details on this gorgeous transformation. Gorgeous! LOVE the wings! The whole design is awesome! 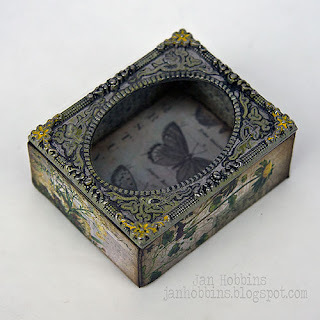 Delightful piece, love all the butterflies and that beautiful little frame. 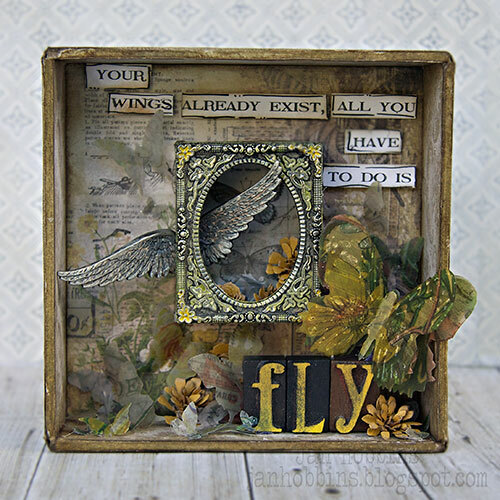 Thank you so much for guesting with us today Jan, your shadow box is stunning! I love every corner of it, such a clever design. The wings behind the frame look fantastic, and the vellum butterflies are so delicate and pretty. The whole project is just gorgeous and so much work has gone into it, I bet it looks even better irl. I always love your work and it is wonderful to see it here! Oh Jan, this is truly amazing! Not all of these assemblages float my boat, but this one sure does!!! I really love every single detail you put into this! I love the busy collage paper with the openness of the frame. I truly appreciate you sharing what you do with the vellum and your butterfly technique. Thanks so much and super job!!! Amazing, as is everything Jan creates. She's such an inspiration. Love the clever use of those wings. Now, dare I say, THAT is thinking outside the box! 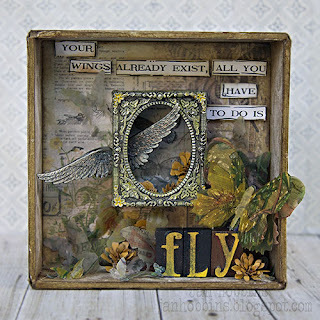 Wow Jan what a truly inspirational project, I love the shadow box within a shadow box and the way you have angled your wings. Just stunning, thanks so much for guesting with us at AVJ...what a treat. Oh my goodness! This project is over the top beautiful and creative! Love everything about it! Jan, thank you so much for being our guest, I have been a fan for a long time. This shadowbox is beyond wonderful. Love each and every detail of it. Thanks so much for sharing your fabulous talents with us. Outrageously brilliant - such a creative use of the Configurations boxes - and what a hot tip that the foundry frame is the right size for on of those little boxes. The metal wings within (and without!) the box are completely inspired. I love the vellum butterflies too. Wonderful to have you as our guest this month, Jan, and thank you for sharing an amazing creation. Jan, I'm joining the chorus of admirers; this is amazing. I'm just blown away by the creativity and the technical abilities combined with your artistic flare. Superb. WOWZERS! This is absolutely FANTASTIC!